Trees in Windsor could soon be under attack. The bagworm has made a return. “Here we go again,” city forester Bill Roesel said. The bagworm was first found in Windsor in 2008. Surveys conducted by Ontario’s Ministry of Natural Resources found the number had increased in 2011. In 2013 new infestations were observed on trees on boulevards, and open-grown and park trees. Attacked species included honey-locust, white cedar, and Norway maple. Roesel says they are back this year in big numbers and threatening shade trees along city streets and in city parks. “The problem with bagworm is that it will feed on a whole bunch of trees. It really feeds on a variety of plants,” Roesel said. The bagworm calls more than 100 deciduous and coniferous trees, shrubs and woody ornamental species home in North America. Cedar and junipers are particularly favourite hosts, according to the MNR. “If you have something that only attacks one species, it’s easier to control,” Roesel said. The worm feeds on leaves, causing “defoliation,” and uses part of the tree to create a “bag” around them for protection. Defoliation on young cedars in Coventry Gardens in Windsor were reported at “moderate-to-severe levels” in 2011. 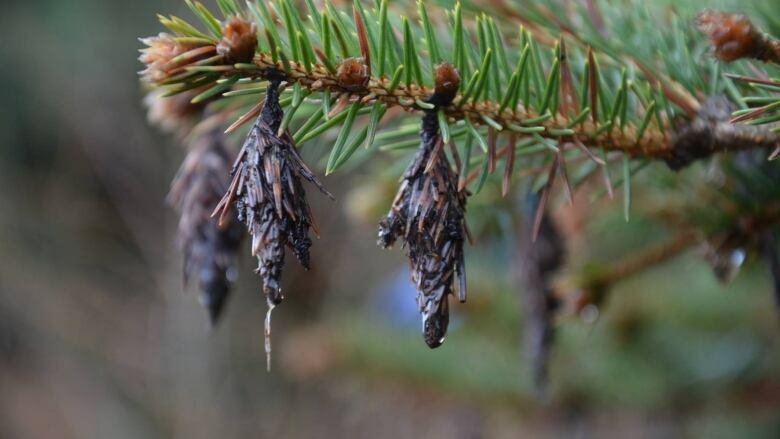 Between 60 and 100 per cent of the cedar leaves were destroyed. Severe defoliation can kill trees. “Usually, if it’s only one or two years in a row, the tree will make a comeback. If a tree is repeatedly defoliated, we can lose the tree,” Roesel said. Roesel said trees from Walkerville to Huron Church Road have been affected. “The trees in Windsor have been able to sustain several years of moderate infestation before showing moderate-to-severe decline or mortality," MNR spokesperson Jolanta Kowalski said in an email. “When this population gets really big, we may have to deal with pesticides,” Roesel said. The MNR said there are control options available. If the populations are small, hand picking the bags and destroying them can help reduce the infestation. The bacterial insecticide Btk (Bacillus thuringiensis subspecies kurstaki) can be applied to the leaves when the caterpillars inside the bag are young and small in size. As the caterpillars eat the leaves, they ingest some of the Btk. The Btk disrupts the caterpillars’ digestion system, and they eventually die from starvation. “It’s not something we want to do but it’s something we have to do,” Roesel said of insecticide. Roesel said citizens can do their part by removing casings and destroying them if they’re found in backyards. The insect spends the winter in the egg stage inside the bag of the female moth. Collecting and destroying the bags in fall, winter, and spring can eliminate the eggs before they hatch. Roesel said the bags look like Christmas decorations hanging on the trees.